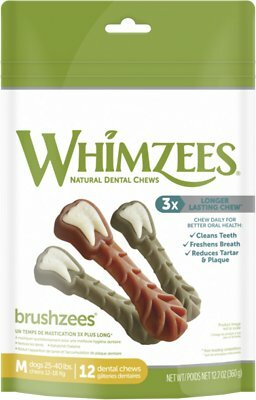 Introduce a new love of “brushing” with the WHIMZEES Brushzees Natural Daily Dental Dog Treats. 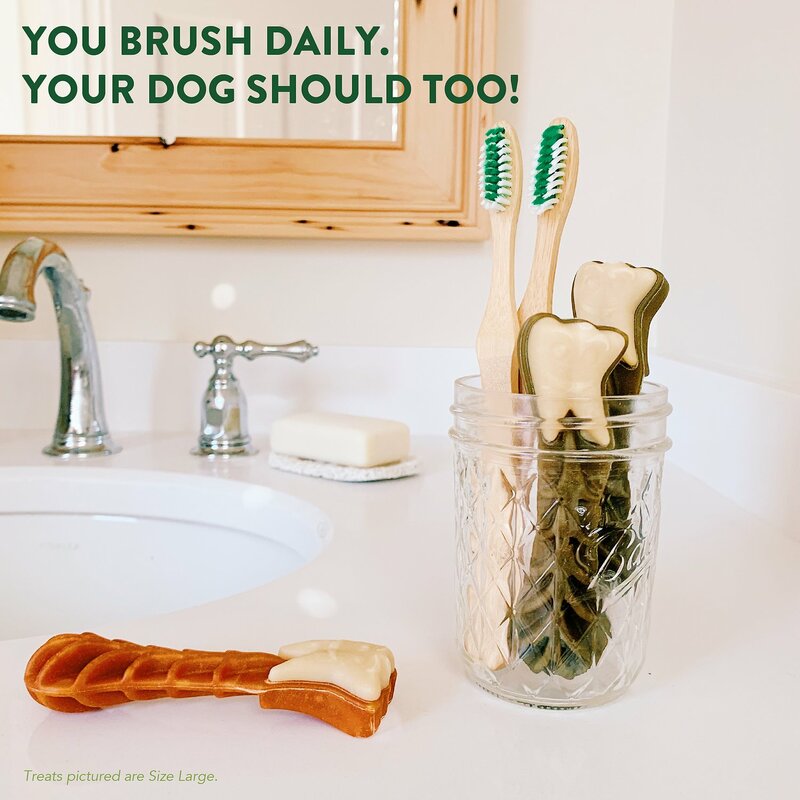 Totally edible and easily digestible, these vegetarian and all-natural treats help to freshen breath and reduce buildup on your dog’s teeth. They’re free of gluten so it’s a great solution for dogs with sensitivities, and they’re made with just nine natural ingredients that have vitamins and antioxidants. 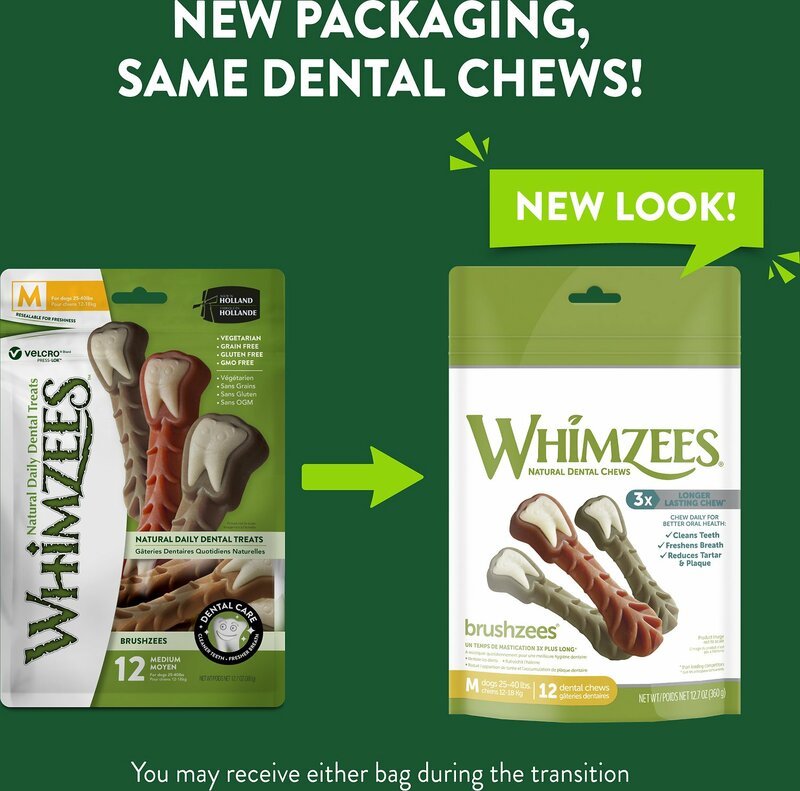 Dental hygiene is as important for dogs as it is for humans, and Whimzees dog treats make it easy for dogs to clean their own teeth. 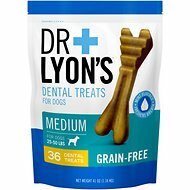 Edible, vegetarian, gluten-free dental treat is a healthy option for dogs with gluten intolerance or food sensitivities. Knobby shape ensures proper blood flow through the gums and prevents bad breath and tartar buildup. Hollow shapes and spaces allow the teeth to easily grip and chew, with grooves that get in between the smaller spaces. Low fat and rich in vitamins and antioxidants, plus fiber to promote regularity and aid in good digestive health. Produced sustainably with no artificial ingredients, colors, flavors or preservatives or GMOs, gluten or meat. Not suitable for dogs under the age of 9 months. As with any edible product, monitor your dog to ensure the treat is adequately chewed. Swallowing any item without thoroughly chewing it may be harmful or even fatal to a dog. Potato Starch, Glycerin, Powdered Cellulose, Lecithin, Dried Yeast, Malt Extract, Sweet Lupin Meal, Alfalfa Extract, Paprika Extract. We recommend one properly sized treat per day. Always have fresh water available for your dog. Store in a cool, clean, and dry place. WHIMZEES are natural dental chews for dogs that are anything but ordinary. No more dog treats with boring shapes—these exciting chews feature shapes like hedgehogs, alligators and other fun designs. They’re made with just a few all-natural ingredients for a simple yet fun dental chew that causes smiles all around. Dogs love to sink their teeth into WHIMZEES, but they're also purposefully designed to promote tooth and gum health. They feature grooves that work their way into the small crevices between teeth, and unique raised nubs that massage the gums and ensure proper blood flow. Gnawing on these delicious dental treats also helps rid your pet's mouth of plaque and tartar buildup. 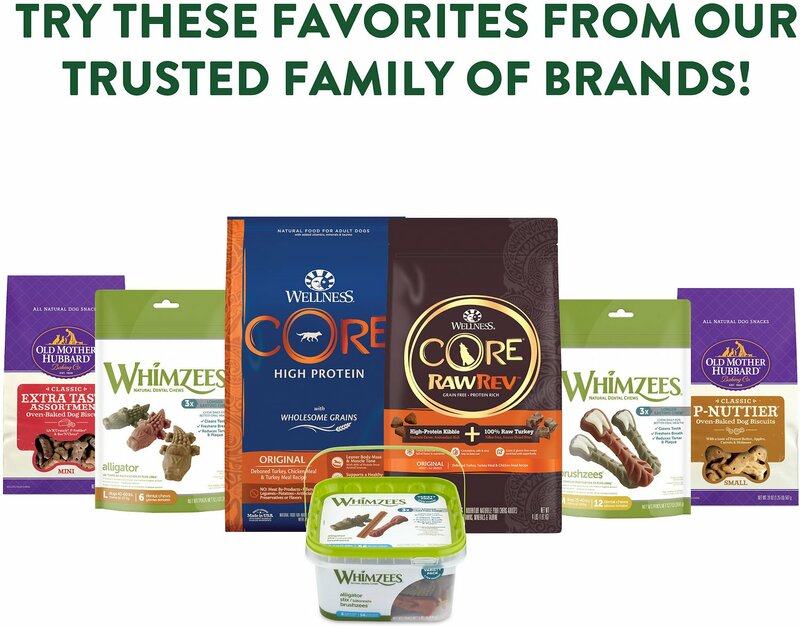 WHIMZEES aren't just fun to chew; they're also seriously good for your pet. These dental chews are low in fat and gluten-free, for starters. They taste great, and they're filled with dietary fiber that makes them easy to digest. 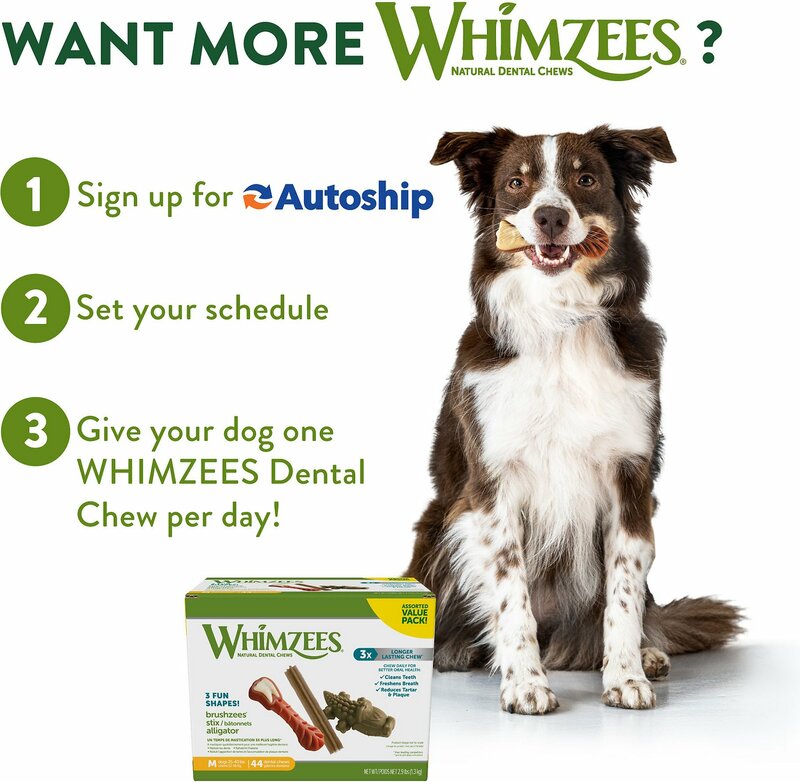 WHIMZEES have vitamins and nutrients that support a nice coat, strong bones and improved metabolism. The coloring comes from alfalfa, annatto and malt extracts that also provide beta-carotene, antioxidants, vitamins K and C, and six B vitamins. You won't find anything that doesn't belong in these chews. 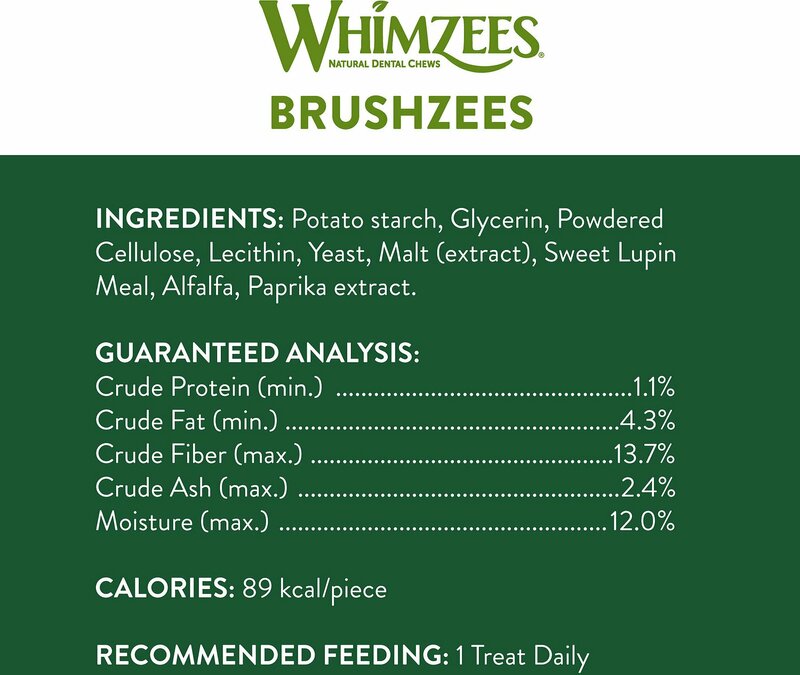 WHIMZEES are simply made with no more than 10 ingredients in any recipe. Each of the limited ingredients has a functional purpose, and there's no room for anything else. Stuff like artificial colors, flavors and preservatives; GMOs; and meat by-products are left out. And so are extra calories and added sugars. is a pure dietary fiber source that polishes teeth and regulates digestion. helps the chews retain moisture and increases palatability. is gluten-free, easy to digest and gives a boost of energy. from vegetables helps stabilize the treats and keep them from being sticky. provides all-natural coloring, improves metabolism and promotes bone strength. contains B vitamins, minerals and amino acids for coat and digestive health. WHIMZEES are sustainably produced in Holland by a company of dog lovers who also happen to love the planet. Their mission is to introduce pet parents to products that are not only fun, but healthy, too, and to do so in a way that's socially responsible. 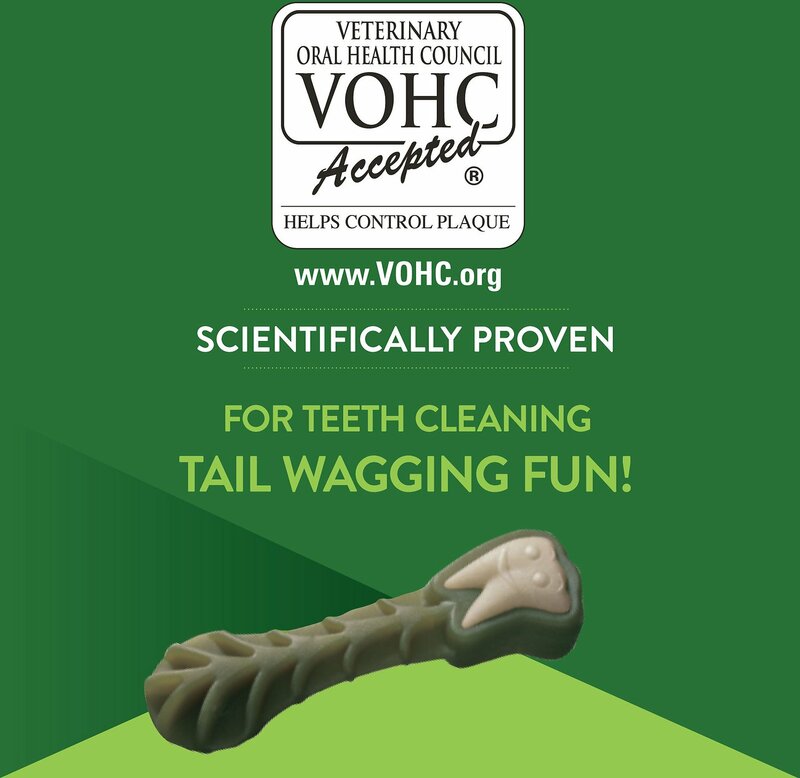 Driven by innovation, they've developed the best quality dental treats with the finest ingredients. I purchased the regular sized ones for my Sharpeis, who are around 50lbs each. These are gone in about 20 minutes. I think the larger size would last longer. They get one or two of these in a weeks time. As with any treat, I try to monitor the servings. Much to their dismay! I think these are among the safest chews there are. Our dog loves them. They keep her busy and keep her teeth clean at the same time. Cute story: We were traveling and when I was packing her things getting ready to leave the hotel, she went around to the other side of the bed, picked up her Whimzee and brought it over to me to pack. She didn’t want me to leave it behind. I think whimzies are a great treat for any dog. I like the ones that are shaped like little toothbrushes.Brushees are great . They are made from vegetables so theyre not fattening.I saved five dollars a bag when I bought two over the pet stores. I recommend them to anyone. Love these compared to the more traditional dental treats which are just a stick with grooves. Even though we’ve tried those which are longer than these, my dog takes his time more with these which I prefer. It’s probably the more unique shape that helps. I wouldn’t go so far to say it does anything with “refreshing” his breath (but they aren’t minty so that’s fine), but I like to give him about one of these a day to him. Sadly we get through them quite fast, but my dog loves them and gets excited to have one of these! These are the longest-lasting chew treats ever! We have two dogs less than 25 lbs., one of which usually demolishes treats within a minute. These last at least 20 minutes for him, and much longer for our dog that has fewer teeth. Small size treats are perfect. Also, I appreciate that they don't stink like rawhides and don't appear to stain fabric, either. Time will tell if they actually have an effect on their dental hygiene, but I imagine they must be doing something! My dog loves getting these for a treat! It takes him awhile to chew the whole thing so it keeps him occupied! He has only had two so not sure how well they clean his teeth yet. 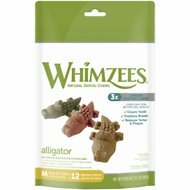 WHIMZEES are a great product for cleaning your favorite dog or pups teeth. Have a mutt the vet said had to much tarter for her age! Rear (molars) were covered with tarter. Not wanting to have a bill from the vet I went on the hunt to find a good,safe chew product. These did the job very well. They are in fact digestible. Be sure to choose size appropriate for your pooch. To small could cause choking. I have 2 small dogs . 1 is 13lbs the other is 18lbs. and I use the small, petit size, 24 per bag. The dogs love them. Thanks for fresh dental chews! Have been searching in local stores for these but all have these open to the air in bins. My fur baby needs soft chews to help existing teeth stay put. 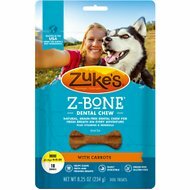 Have tried many other dental chews but love the natural ingredients and scent of these chews. I was so disappointed thought these would be a great treat for both my dogs but they avoided these like the plague, oh well you win some and you looose some the other teeth cleaning products I have purchased from chewy they love, too bad I can’t use these to clean MY teeth lol.